First of all, “Small Wind” has been defined by the American Wind Energy Association (AWEA) as any turbines under 100 kW of rated power. As we all know, 100 kW wind turbines aren’t small! Therefore, others have decided to define them as anything up to 10 kW. For the purpose of this article, we use the same definition as AWEA, up to 100 kW. Let’s start with the nameplate rating of the wind-turbines. The internationally acknowledged standard is to rate turbine power at a wind speed of 11 m/s (24.75 mph, or 39.6 km/h). 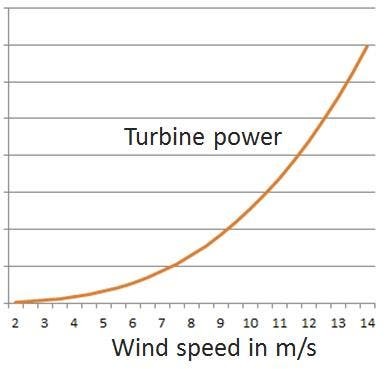 As most insiders know, the power of the wind (and therefore the power of the wind-turbines) goes up by the cube of wind-speed (double the wind-speed means 8 times the amount of power). We have noticed many “inventive” marketers of small turbines rating their product at wind-speeds higher than 11 m/s (we’ve seen ratings at up to 15 m/s), which effectively means they are overstating the turbine’s performance. In order to illustrate how “effective” (or misleading) this marketing can be, you can do the simple math on the cubed function of power versus wind-speed. The wind-power at 13.86 m/s is roughly double compared to 11 m/s, meaning if someone declares a power rating of 10 kW at 13.86 m/s, they are selling effectively a 5 kW turbine. There are a few common beliefs that we have noticed from talking to interested buyers from all over the world. Common belief #1: “Small Wind is more expensive than Big Wind.” That is generally a true statement, if one compares only the installed cost per rated W. For onshore Big Wind the cost is generally around $2/W of rated power (offshore Big Wind is up to $9/W) and that of onshore Small Wind currently spans from $3 to $7/W. However, Big Wind requires massive grid infrastructure and long-term Power Purchase Agreements (PPAs) to be negotiated with utilities (or determined by regulation), whereas Small Wind typically offsets the customer’s full retail cost of electricity, which can be up to 5 times higher than long-term PPA rates. My home country of Germany is a good example where utility grid capacity is causing some major hurdles for the evolving “Energiewende” (loosely translated the “Transition to Clean Energy”) and more distributed power could lessen the strain on the existing grid. Feed-in tariffs for Big Wind have been declining continuously, whereas the consumer cost of electricity (which is the cost that Small Wind can offset) has almost doubled over the last 10 years. Common belief #2: Small Wind is not worth the effort taking into consideration the hassle of zoning and building permits. Well, that really depends on how small the turbine is. Generally speaking, most turbines under 5KW nameplate power rating (at 11 m/s) installed at low height in residential areas with many obstructions leave their owners disappointed with their Annual Energy Production (AEP). In most cases, this is caused by a low “quality” of the wind at the specific location (the site was not chosen for its wind properties, but simply because the owner happens to live there…). A 5 kW rated wind-turbine can cost anywhere between $15,000 (total cost with shipping, installation, inverter, mast, building permits, and electrical work) and $25,000. In bad residential locations, the AEP can be as low as 5 MWh, which would result in a very long ROI (return on investment), of up to 25 years or more, dependent on the cost of power. However, if one looks at the higher end of Small Wind (i.e. 25 kW), the locations are chosen wisely, and an efficient turbine at $3/W is chosen, the Return on Investment can be as short as 3-4 years. Common belief #3: Small Wind cannot compete with the (currently low) cost of solar. Well, that is true in many areas, even in some areas with low insolation. However, due to the cubed function of power vs. wind speed, as explained above, the AEP for wind has an unequally larger range, dependent on the location. Here is an example comparison of a 25 kW rooftop solar installation at $3 per Watt (installed, with building permit, inverter, and all electrical work), and a 25 kW wind installation at $3/W installed (which we have verified is feasible, although the price range can go up substantially). Scenario A: 25kW solar is installed on a rooftop in Arizona, producing over 5 kWh/day per kW-peak installed (annual average), resulting in an AEP of roughly 43 MWh. If the wind-turbine is installed at a low-wind location with annual average winds of let’s say 5 m/s, the AEP would only amount to 31 MWh at 95% system availability. In this case, the solar investment would clearly yield better returns. Scenario B: The exact same solar and wind product would be installed at a fairly good wind location in Japan with annual average winds of 7.5 m/s (there are many such locations, especially in coastal areas, mountain ranges, and islands), the numbers would be as follows: Solar would yield an annual average of around 2.7 kWh/day per kW-peak installed resulting in an AEP of roughly 23.4 MWh. The wind turbine, however, would produce an AEP of 74 MWh at 95% system availability. In this case, the wind investment would yield 3 times more annual energy than solar. It should be noted that these scenarios only compare the Annual Energy Output of an equivalent investment amount (wind/solar) in different locations. However, any investor in distributed clean energy will look at the existing federal, state, and local incentives and the specific feed-in-tariffs (FITs) at the site. For example, the present FIT for Small Wind in Japan is roughly double that of Small Solar, making the wind investment of scenario B roughly 6 times more profitable in Japan. On the other hand, it has to be mentioned that solar energy production matches the typical average daily energy usage peak between 2:30 pm and 6:30 pm (which is the combined peak for industrial, commercial, and residential use) more predictably, at least in summer. So dependent on the net metering scheme available, solar will provide the advantage of peak pricing, which Small Wind could only achieve that with the use of storage. In many net metering schemes, the offset of consumer retail cost will depend on when the energy is produced and how closely it matches the usage patterns. Solar is obviously not a great match for the usage pattern of a parking structure’s lighting system, but it is definitely more predicable than wind. 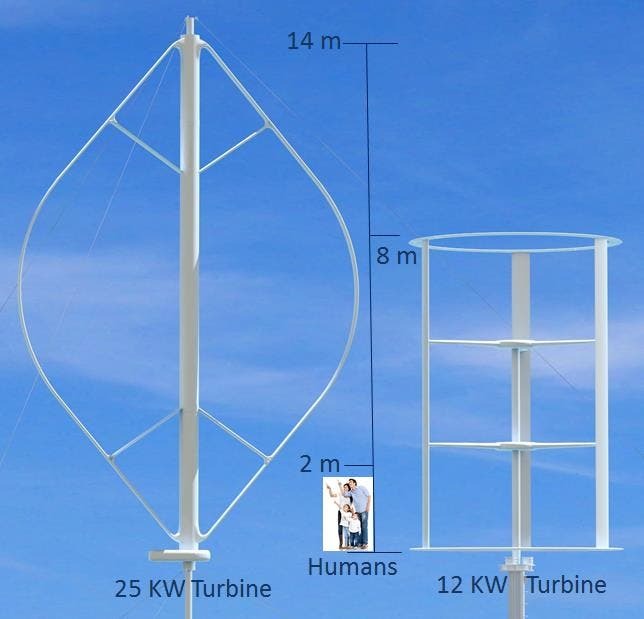 Due to the sheer size, a 25 kW wind turbine is not really suitable for the average single family home in urban areas, nor is it suitable for the average residential rooftop. The target application (good winds is obviously always a given) would be on suburban or rural properties, commercial and industrial buildings, off-grid properties (the US alone has over 500,000 of those), agricultural, large billboards, parking structures, remote telecommunications equipment, freeway lighting, and islands. In many of those instances it could very well interact with solar and a reasonable amount of storage to allow for complete grid autonomy. 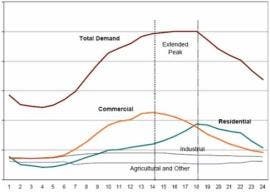 Japan is of course an exceptional opportunity with its currently unbeatable FITs for Small Wind (guaranteed by the central government for 20 years), but it is to be expected that they will eventually follow the declining trajectory of solar FITs over the next 10 years. Generally, the success of Small Wind has not been as consistent as that of Solar, mostly because it is a lot more complex to understand and evaluate. We recommend that any property owner, business owner, developer, or investor interested in Small Wind seek advice from a professional and conduct a wind survey at the location to improve the prediction of the AEP and the success of the installation. Our conclusion: Despite its higher complexity, there are plenty of locations and applications all around the world where Small Wind is superior to any other distributed clean energy technology currently available. And for those who choose any of the more aesthetic turbine designs, you will be pleasantly reminded of your investment, not only by the monthly energy reports…. About the author: Hagen Ruff is the founder and CEO of Chava Wind LLC and Chava Energy LLC.